Now that your child’s journey in the GEP has begun, you may worry about how your child copes with the programme. In this post, we will share our insights of the GEP programme and what it entails. 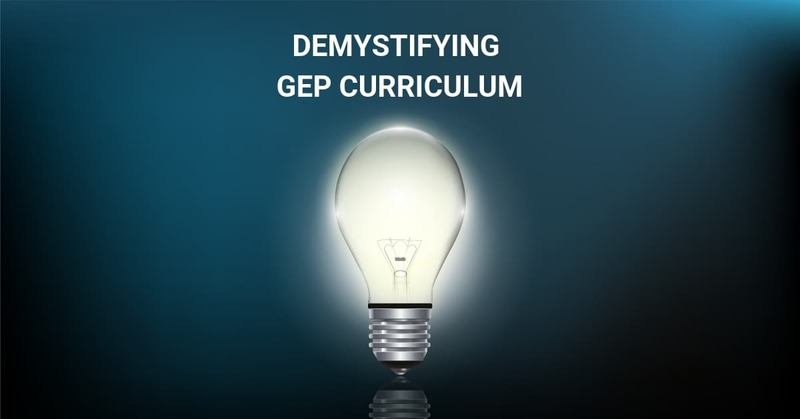 What does the GEP curriculum comprise of? The GEP programme follows a centralised plan rolled out by the Gifted Education (GE) branch in MOE. All students will be taught the same curriculum with standardised examination papers. Is the GEP based on a set of accelerated curricula? English: It will be focused on the literary arts and literature. Rather than getting students to memorise difficult vocabulary or do grammar worksheets, the emphasis is on helping the students to develop a love for the language. There will be different genres of writing for students to explore in the GEP every year. For example, students can be learning about mysteries in Primary 4, detective fiction in Primary 5, before moving on to biographies in Primary 6. There is a recommended reading list for students every year, to satisfy their voracious appetite for reading. Students will be reading books and articles rich in content to help them improve their English naturally. They may also have the chance to write their own book comprising of a few chapters. Mathematics: There will be no secondary school topics covered in the GEP curriculum. All current topics, such as whole numbers, volume and circles, will be taught a more complex or in-depth level. Students will be given additional worksheets tailored to their ability. Every term, they may also be given mathematics assignments, designed for them to prove mathematical theories. Science: Again, students will not be exposed to secondary school topics. Rather, the focus will be to provide an in-depth curriculum of primary school science topics. There will be many scientific experiments to encourage hands-on learning as well as assignments whereby students have to apply their scientific knowledge to solve real-world problems. Chinese: This will be similar to the mainstream curriculum. The GEP also encourages interdisciplinary approaches where knowledge is applied to real world contexts synergistically. For example, knowledge from Science, Technology, Engineering and Mathematics may be used together and applied to solve real world problems through research and design thinking. What are the daily lessons like? To ensure that every individual student gets differentiated instructions and guidance from the teachers, the class size is kept relatively small, with a ratio of one teacher to about twenty students. Do students spend their time doing group work? There will be an eclectic mixture of pedagogies to engage the students. Every day, they might have something different. Not everything will be necessarily group work. Will students have opportunities to take part in nationwide competitions? As they are enrolled in primary schools with wide-ranging presence in various academic competitions and CCAs, they should have opportunities should they qualify for these competitions. The most frequent competitions are organized in mathematics field. There are a few English spellings and writing contests. Projects based competitions, such as odyssey of the mind, future problem solving and STEM (robotics, coding and invention) showcases. For a select group of students who display exceedingly exceptional giftedness, they will be encouraged to join Masterclasses. These masterclasses are specially catered for such students. Some examples are the Primary Mathematics Masterclass, Primary Science Masterclass, Advanced Mathematics Enrichment Classes and so on. There are various partnerships and collaborations with secondary schools, tertiary institutions and interest organisations. Mentorship programmes where students get opportunities to interact with professionals and academics in specific fields are also offered. In the Science Research Programme, students will get to be involved in research projects with guidance from scientists and engineers from the National University of Singapore (NUS). The Creative Arts Programme is specifically for young writers and grants them exposure to different literature and art forms. This programme is organised in partnership with the Centre for the Arts, NUS. Writing workshops by established writers and mentorships are available for GEP students. In our next blog, we will share with you how students will be assessed in GEP, highlights of the major projects for GEP students, and whether GEP students have any advantages in PSLE and DSA applications.